In some ways, Overwatch’s new hero, Moira, announced yesterday at BlizzCon, feels like a stronger take on the basic premise underlying sniper grandma Ana: she’s a healer for people who hate playing healers. I’ve gotten to play a few matches as Moira (first name: “Mines Of”) during BlizzCon, and I’ve been having a blast. Two blasts, actually—one that heals and another that grips enemies like some Eldritch tendril, draining their life force and replenishing hers. She can also launch biotic orbs that bounce around and heal/damage allies/enemies who are relatively close to them (no direct contact needed). Lastly, her ult is Goku’s kamehameha—a beam of concentrated fury that cuts down every enemy in its path—but it’s also Goku’s firm, friendly arms wrapping allies in a healing hug. It does both those things at once, depending on who it hits. What I’m saying is, Moira fires Gokus at people, and it rules. Offensively, Moira can feel like a more aggressive Symmetra, albeit with better mobility and a longer effective attack range. She’s got a beam that tethers itself to enemies, as well as a big orb she can launch periodically that does solid damage, but (perhaps more importantly) is a giant, glowing cry of “GET OUT OF THE WAY,” which is nice for busting up enemy formations. While you’re on the attack, her “fade” mobility skill, which is like Reaper’s wraith form if Reaper realised there was an edgy cloak sale downtown, but it was ending in two seconds, is also key. Moira is more survivable than you might expect thanks to her life leech, but when things get crazy, she still goes down pretty quickly. Better to blip out and approach from a different angle than to get cornered by the Reinhardts, Winstons, and Reapers of the world. These abilities map nicely to healing, as well. Moira’s heal beam doesn’t have a huge range, but it can heal multiple allies at once, and you can use fade to reach allies who are hurting in a blink. Her bouncy healing orb, meanwhile, can supplement that healing (albeit erratically) and also heal Moira as well. 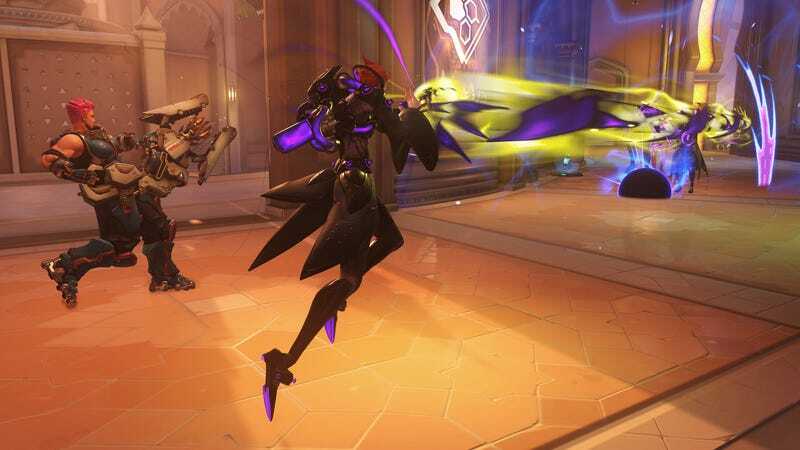 In confined areas, especially, Moira’s beams and orbs can burst-heal a team with a surprising speed. Then there’s her ult, which is just preposterous. The second time I ever played as Moira, I got a team kill with it. If your team is having trouble busting through a choke point, consider Moira’s ult your battering ram. It’s also great in those situations because it’s a heal that elegantly cuts through chaos. You don’t have to worry about where you’re aiming like you would if you were, say, Mercy or Ana. Just open fire and let it tear through everybody, friend and foe alike. Moira’s downfall, if you even want to call it that, is that she’s a support in the truest sense of the word. As a solo damage dealer, she’s not quite consistent or defensively sound enough to pull her own weight, and as a healer, she’s too limited to prop up an entire team. In either case, she works well as a supplement to a composition with other characters in those more dedicated roles. This is due in large part to the fact that Moira has to deal damage if she wants to keep healing. Her healing ability has a “biotic” resource meter that can only be refilled by her attacks. Since she’s a mid-to-close range combatant, this means she’s often not in an optimal spot to heal, which makes figuring out positioning and timing complicated. When Moira’s able to fill in gaps in a composition, though, she becomes a goddamn force to be reckoned with, sucking the life out of single targets and keeping flankers and other offensively minded allies topped off in the heat of battle. 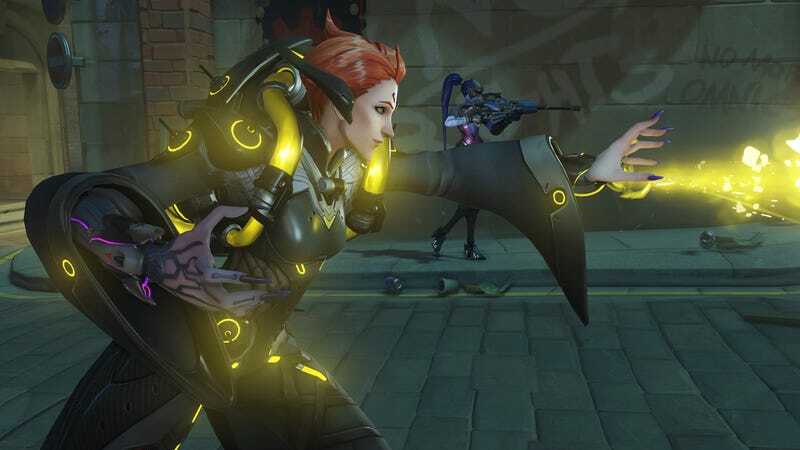 Moira is a character who will confuse and befuddle many players, but she’s got serious potential to round out team compositions and turn the tide of battle with her ult. A mad scientist David Bowie lookalike who fires Gokus from her hands, she’s also just super fun to play. She is, to me personally, a much more exciting hero than recent offerings like Orisa and Doomfist. I’m looking forward to playing her a lot more whenever Blizzard decides to release her. And also right now, because I’m still at BlizzCon, so... bye.